Trustworthy product and Great service! Everyone was professional & courteous ... and we were quite impressed that Arlen called the evening before to say ‘he might be a little late’. I am happy to recommend Comfort Zone Insulation to any of my friends & clients. Above grade and below grade exterior walls, including rim joist spaces. Using closed cell spray foam adds strength to the structure, reduces drafts, helps protect the building and its occupants’ from issues such as mold and poor air quality. Overall making your home more comfortable and energy efficient. 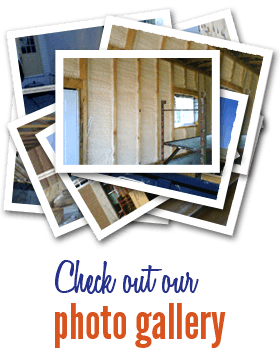 The Attic is the most cost effective place to add insulation. Vented and Non-Vented Attic spaces can be insulated with closed cell spray foam providing effective insulation and air/vapor barrier all in one application. Cellulose in a vented roof system or a combination of spray foam and blown cellulose can also be a cost effective option. such as vented crawl spaces and unheated garages. Also insulate any portion of the floor in a room that is cantilevered beyond the exterior wall below, foundation walls of unvented crawl spaces. These are common areas where the floors can be cold . Spray foam can effectively add insulation and an air leakage barrier in one application. A properly insulated basement can save you money on heating and provide a dry, comfortable living space. Spray foam insulation in a basement ensure a continuous insulation between slab and rim joist. Spray foam insulation considerably reduce the risk of condensation, compared to conventional insulation in these areas. Each green circle to the right represents an advantageous area to insulate. Simply place your mouse over a circle to learn more.